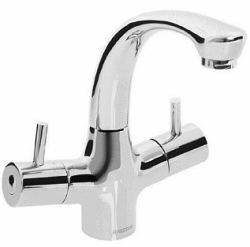 There are various considerations when selecting taps and mixers (generically known as 'brassware') when the user may have difficulty operating the device or if thermostatic temperature control is necessary to prevent scalding. More specifically, if rotating a knob is difficult through impaired strength or the inability to grip, especially with wet hands, lever controls can be the solution. Elderly and disabled persons may also suffer from reduced strength of grip, reduced sensitivity and the inability to sense and therefore react to extremes of temperature - thereby running the risk of scalding should water flow from a tap that's too hot. Scalding in baths has long been recognised as a serious issue. This can happen in a normal bath, but the advent of walk in baths has accentuated the need for a means to prevent the very real risk of scalding while the bath fills. Consider, when a walk in bath is used the occupant gets in, closes the door and begins to fill. At this moment the risk of scalding exists should water enter the bath too hot. If by accident water enters the bath at a high temperature the bather, unable to react quickly enough, may suffer horrific injuries as scalding water pours on their feet. Happily, the solution is fairly simple. By incorporating thermostatic control into the water supply, temperature can be both regulated and stabilised. There are two simple ways this may be achieved. 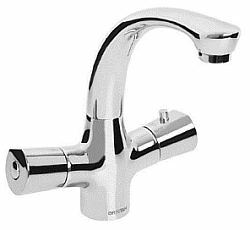 Incorporate a thermostatic mixing valve (TMV) into the supply to the hot water tap. The all-in-one thermostatic control is by far the easiest method for domestic applications but limits the design of brassware. Whereas incorporating a TMV in the system allows the use of more or less any brassware as protection is assured before water reaches the outlet point. 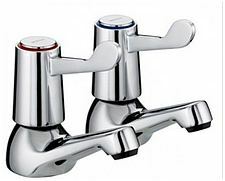 While thermostatic control is an actual necessity in some domestic hot water systems (for example: mains pressure hot water systems - unvented systems and combi boilers) it is a very good idea anywhere hot water is on tap and can prevent horrendous injury to young and old, fit or infirm alike. The following represents a range of products designed to enhance safety and aid the user's ability to operate. Options for lever controls and thermostatic protection. An excellent safeguard against scalding on any bath.